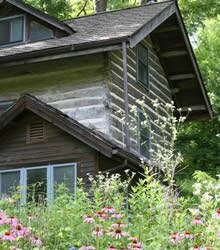 Welcome to Fern Hollow Cabin, a historic log cabin in the lush woods of Northeast Iowa. Come alone, or come with friends or family. Come sit still, or come play all day. Are the dates you want already booked? Maybe you'd like to stay in Sophie's Room, a large beautiful bedroom in our timberframe solar home. Click here to see if it's available. still know how to enjoy the passing of time. space, or hermitage for a silent retreat. It's all of these, and whatever else you’d like it to be! This is my great-great-great grandparents' cabin, built in 1853. We restored it in 1989, and lived in it for 15 years. It's really beautiful! We warmly invite you to come and stay for a day or more. Come wrap yourself in the songs of the woods. "To live content with small means; To seek elegance rather than luxury, and refinement rather than fashion; To be worthy , not respectable, and wealthy, not rich; To study hard, think quietly, Talk gently, Act frankly; To listen to stars and birds, to babes and sages, with open heart; To bear all cheerfully, Do all bravely, Await occasions, Hurry never. In a word, to let the spiritual, unbidden and unconscious, grow up through the common ~ This is to be my symphony."